Today, the Chief Justice John Marshall Commemorative Silver Dollar Coin remembers when the Supreme Court ruled on several railroad issues on April 4, 1910. An article in the Salt Lake Tribune of April 5, 1910 described the issues, some decisions satisfied the railroads while others would be re-visited. Roads Need Not Build Switches to Grain Elevators Unless They Wish. Hotel and Other Drummers Cannot Operate on Trains Without Permission. Emphasizing the rights of railroads, the supreme court of the United States today declared unconstitutional the law of Nebraska requiring railroads to build switches to all grain elevators along their tracks upon request, and called a halt on the attempt of the state of Arkansas to penalize an interstate railroad for failure to supply cars enough to accommodate interstate traffic. He held their property could not be taken without compensation, as he said the law proposed to do in requiring the railroads to build switches to the elevators. Justice White, in announcing the opinion in the Arkansas case spoke of the right of the railroads “to sail under the flag of the constitution,” rather than under the black flag. In using this language in the announcement of the opinion, Justice White was referring to the decision of the supreme court of Arkansas which discussed the fact that the St, Louis Southwestern railway was unable to furnish more cars for local traffic, because of the requirements of the American Railway association as to cars going out of the state f Arkansas. In the written opinion, the rights of the railroads were phrased somewhat differently from what they were in the oral explanation of the court. Among other decisions the court upheld the act of Arkansas prohibiting drumming up of business by physicians and hotel keepers on trains. An odd thing about the sitting was announcement as to the decision of the court of an opinion written by the late Justice Brewer. The question as to whether the penalty for violation of the twenty-eight-hour law for shipment of livestock shall be assessed on the separate shipment, as urged by the government, or on the trainload as a unit, as contended for by the Baltimore & Ohio Southwestern railroad, is to be considered again by the supreme court. By a division of four to four the court affirmed the judgment of the lower court which decided in favor of the government. The railroad was dissatisfied and as a result the court today set the case for re-argument next August. 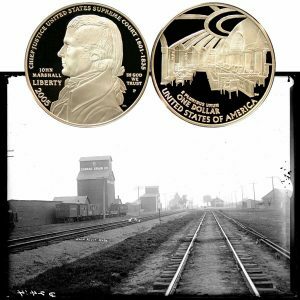 The Chief Justice John Marshall Commemorative Silver Dollar Coin shows with an image of Nebraska railroads and grain elevators, circa 1910.